Our album demonstrating a dramatic and surprising change! It seems so long ago now! 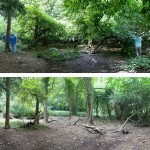 But here are the results of the working party on the 12th July. 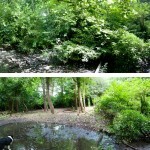 A great and productive event cutting down laurels from around the small pond on the Echo walk. Some of these were so different after the event that it proved extremely difficult to find the same vantage points! 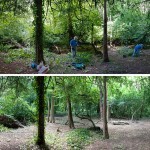 The plan is to continue this work and remove more of the laurel that chokes the woodland floor preventing native species from fighting their way through. 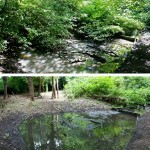 We plan to clear out the pond and with the improved sunlight it should be possible to turn it back into an attractive wildlife feature. A clean pool, some oxygenating plants, and a bit of care and it should be as good as new. Although we don’t know the date of the pond it is possible that it was built as part of Napier Miles’ oriental gardens laid out below the Echo. During our work we chanced across a remnant bamboo plant which, along with the Japanese Cedar, Capadocian Maple, Japanese laurel, and even Japanese knotweed (!) appear to have formed some of the original planting. It’s always lovely when people come along and share their reminiscences with us, and on this event we had someone recall the 1950s when there was much much more bamboo around the pond and they enjoyed hunting through it playing Cowboys and Indians. The panorama-stitching programme had real difficulty in trying to read these images and work out what was going on in them, so apologies for any odd quirks. This looks towards the Echo from just below the pond which you can just see in the second photo in the middle the right. From dark chaos into a light open glade where, we hope, the long lost bluebells and primroses will resurface over the next couple of years. The view from the Echo path looking towards the pond. 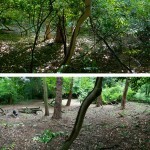 The additional fell of depth in this part of teh park is a dramatic change! 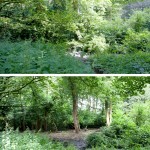 In the first view you can just pick out the small dam on the right and the edge of the pool to the left, but you could be mistaken in thinking this before and after weren’t even in the same park!